For the newsletter this month, I was searching for something International and a dessert on Pinterest, and then I stumbled across this pin. For those of you new to Pinterest, it is a virtual bulletin board where you can not only pin pictures, but the links of where the pictures came from. It is a great place to pin recipe and recipe ideas, as well as decorating ideas, funny stuff, and home improvement ideas. I love to use it for trying new recipes plus it is a good way to be a hoarder (it is all virtual)! Sooo... I gave this little Homemade Dulce de Leche beauty a try this month. I had heard of this idea several times before, I had never tried it myself however because most of the original recipes require you to boil an unopened can of sweetened condensed milk. The idea of a can of sticky anything exploding in my kitchen deterred me from trying it, until now. The method that is used in this pin allows a tiny prick in the lid of the can, or a tiny vent for air to escape. Someone in my house, while pregnant, did have an experience with things blowing up in the kitchen. I am not going to tattle on said person, but I will admit three things; First, that pregnancy does make people who are boiling eggs forgetful, and second, eggs can and will explode, ruin a pan and require someone to scrape eggs off a 15 foot high ceiling and third, three people live in this house, my husband (who does little cooking), an infant, and myself. Let's move along, shall we? You can follow the direct link for the blog owner's directions, and I will tell you what I did and provide you with my results. The title image, which is linked at the bottom is the beautifulness that I am trying to recreate. First, start with a can of sweetened condensed milk, washed with the label removed. If this can has a pop top, pull it back, only enough to break the seal. If your can requires a can opener, use it to make the tiniest of holes in the top of the can. During cooking some of the milk did ooze out, and it was completely fine. Second, using a stainless steel saucepan, insert can, hole side up, and fill with water about 3/4 of the way up. Use a pan you do not care about, perhaps one that exploding scorched eggs have ruined. The simmering can did etch can marks in the bottom of my pan. Third, turn heat on and allow water to reach a simmer, reducing heat to low after a simmer is reached. You will continue to simmer the can, for 3 and half hours. Check frequently to ensure that the water stays at the 3/4 level. Fourth, turn heat off and allow can to cool completely. After cooled, remove lid and stir to combine the gooey cream. I followed the provided recipe to a T. Results? It turned out perfectly. The three and a half hours of cooking time is worth it, hands down. I have tried the dulce de leche on waffles, fruit and on a spoon, lots of it on a spoon. 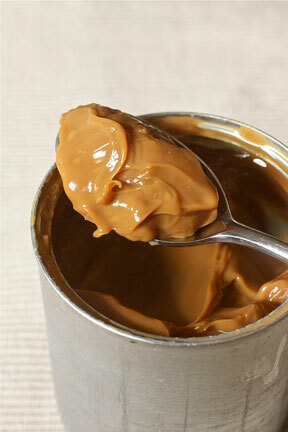 It is very rich, and a bit more pudding like than caramel. The taste is incredibly rich. I can't wait to try it on ice cream. Suggestions- I read in reviews of the recipe that you can put a towel on the bottom of your pan to prevent etching, that is my only suggestion. 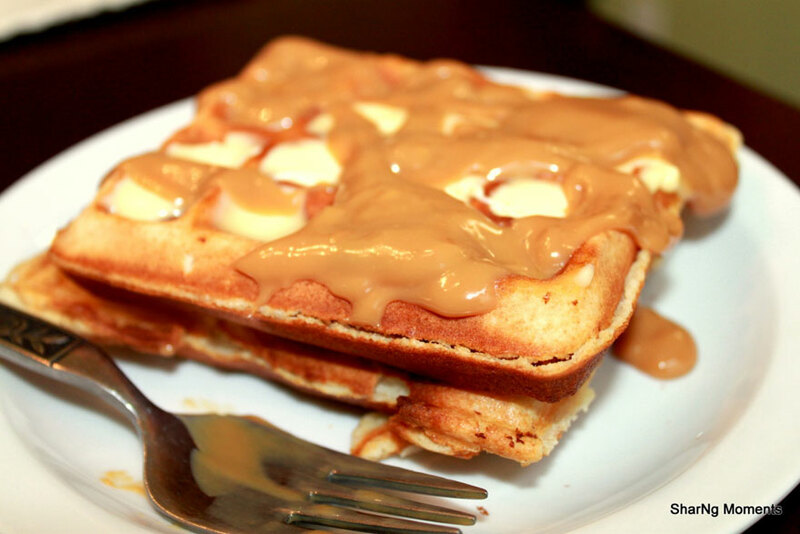 Here is a picture of my dulce de leche on waffles. I am already planning to do this recipe again in a few weeks to fatten up my ice cream loving dad when he visits us. It is so good, I dare you to try to not eat it straight from the spoon but if you do, I won't tell a soul.